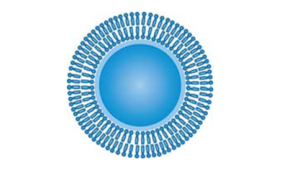 Sovicell’s TRANSILXL Microsomal Binding Kit provides a fast high throughput assay based on the affinity to human liver microsomal membranes. The Microsomal Binding Kit is one of Sovicell’s range of ready-to-use assay systems for DMPK and ADMET studies. 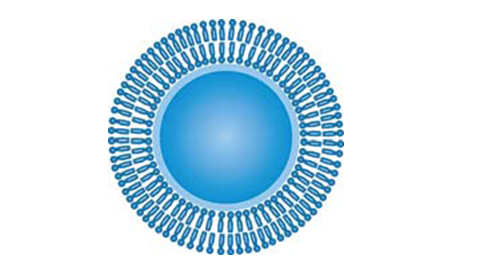 The kit is based on a ready-to-use 96-well microtiter plate carrying TRANSIL beads with a single lipid bilayer reconstituted from with a single lipid bilayer reconstituted from synthetic lipids resembling a natural composition of human liver micromes. It can be used to estimate the affinity to human microsomal membranes and determine microsomal binding, with rapid compound quantification due to immobilized brain membranes. The TRANSILXL Microsomal Binding assay kit is designed for automated liquid handlers or manual pipetting. It consists of ready-to-use 96-well microtiter plates. One plate can be used for measuring microsomal binding of up to 12 compounds. The included spreadsheet enables easy calculation of final results, with a ‘traffic light’ system for data quality rating. In initial drug research, the main emphasis is on being able to predict the pharmacokinetics of the drug in humans to help identify candidates with appropriate characteristics, with metabolic clearance as a key parameter to be quantified. This can be achieved either via extrapolation using allometry or through translating an understanding of metabolic stability in preclinical non-human species, liver microsomes and hepatocytes to those in human. 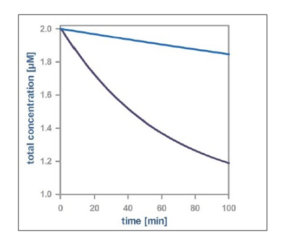 In the latter case, there has often been the assumption that the concentration added to the microsome or hepatocyte incubation is the same as the unbound concentration in the incubation. Recent research has shown that binding to microsomes and hepatocytes can be significant, and hence the unbound concentration is lower than the total concentration added, often resulting in a dramatic effect on the estimate of clearance. 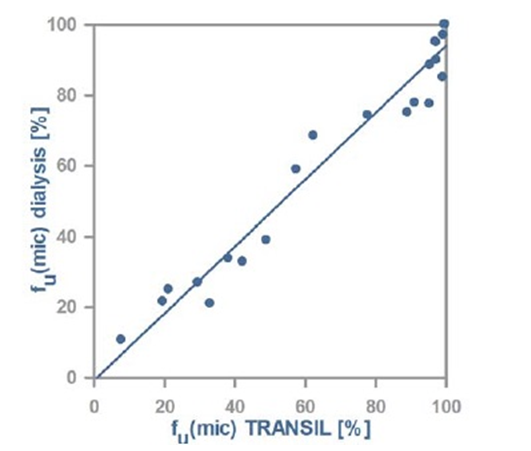 Consequently, it is important to estimate microsomal binding in these in vitro incubations. Binding to microsomal membranes is often estimated as the free fraction of drug in incubations of microsomes (without cofactor) in dialysis rigs, requiring overnight incubations. These experiments can often suffer from compound instability through hydrolysis and precipitation of poorly soluble drugs. Moreover, the free fraction which is determined experimentally relates to the experimental concentration of microsomes which will in many cases differ from the incubations that have occurred with the metabolic stability experiments. To adjust the free fractions in the microsomal binding experiment to the free fractions in the metabolic stability experiment an equation developed by Austin and coworkers is used. However, this equation is limited in the range concentration changes of microsomal incubations. Use of the TRANSILXL Microsomal Binding Assay can overcome all these limitations. Microsomal binding not only reduces the concentration of free drug available to be metabolized by CYP enzymes, it also reduces the concentration available to inhibit the enzymes. Since non-specific microsomal binding can account for underestimation of inhibitor potency (i.e., overestimation of IC50 or Ki values) when dealing with lipophilic basic drugs, this in turn can lead to an underestimation of risk of drug-drug interactions. In particular, mechanism based inhibitor studies can be affected to a large extent by microsomal binding, because of the high microsome concentrations that are typically employed in these experiments. Hence, the fraction of drug bound to microsomes is also an important correction of experiments assessing the inhibition potential. 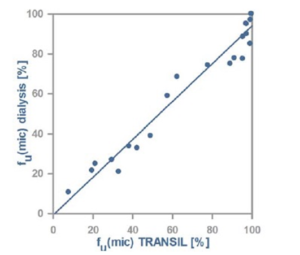 The TRANSILXL Microsomal Binding Kit is compatible with a range of detection systems, including LC/MS/MS and Scintillation counting. Parameters can be estimated and predicted for affinity to human liver microsomes, Human fu(mic), with applications for fu(mic) in other species being developed. Click on TRANSIL Microsomal Binding Kit for more information. Click on Technical Information to download PDF fact sheet.